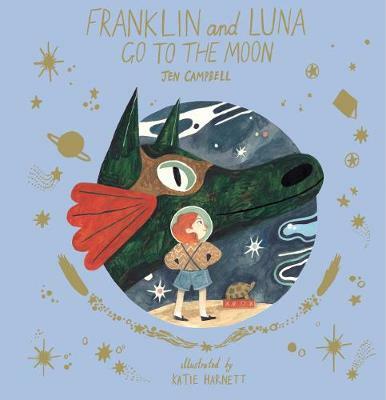 From the creators of the bestselling Franklin's Flying Bookshop, Jen Campbell and Katie Harnett, comes another charming tale about two book-lovers Franklin and Luna. Luna and her best friend, Franklin the dragon, love stories and want to visit all the places they've read about in books. But for all their reading they still don't know where dragons come from. And Franklin is now so old - 605 to be exact - he can't remember himself! They search high and low, but to no avail. Until one evening, Luna's tortoise, Neil Armstrong, notices something far away in the sky... The three friends set out on their biggest adventure yet - all the way to the moon - in the hope of reuniting Franklin with his long lost family. Jen Campbell is the Sunday Times bestselling author of the Weird Things Customers Say in Bookshops series, which was a finalist in the Goodreads Choice Awards. Her latest non-fiction book, The Bookshop Book, was the official book of the `Books Are My Bag' campaign. She's also an award-winning poet and short story writer. Katie Harnett is a sought-after British illustrator with an MA in Children's Book Illustration from the Cambridge School of Art. She won the 2015 Ars in Fabula Award and is the author of Archie Snufflekins Oliver Valentine Cupcake Tiberius Cat.